Stiglitz notion that foreign advisors feel superior to the locals, is by no means new. This account of a perceptive Italian Merchant in 16th century India suggests that European did something similar back then. "The Florentine Piero Strozzi, was willing in 1510 to write of the Muslim merchants of Goa, 'We believe ourselves to be the most astute men that one can encounter, and the people here surpass us in everything. And there are Moorish merchants worth 400,000 to 500,000 ducats. And they can do better calculations by memory than we can do with the pen. And they mock us, and it seems to me they are superior to us in countless things, save with sword in hand, which they cannot resist'." Sanjay Subrahmanyam, "'Um bom homen de tratar': Piero Strozzi, a Florentine in Portuguese Asia, 1510-1522," Journal of European Economic History, XVI(3). "It's not fair to say that IMF economists don't care about the citizens of developing nations. But the older men who staff the fund--and they are overwhelmingly older men--act as if they are shouldering Rudyard Kipling's white man's burden. IMF experts believe they are brighter, more educated, and less politically motivated than the economists in the countries they visit. In fact, the economic leaders from those countries are pretty good--in many cases brighter or better-educated than the IMF staff, which frequently consists of third-rank students from first-rate universities. (Trust me: I've taught at Oxford University, MIT, Stanford University, Yale University, and Princeton University, and the IMF almost never succeeded in recruiting any of the best students.)" 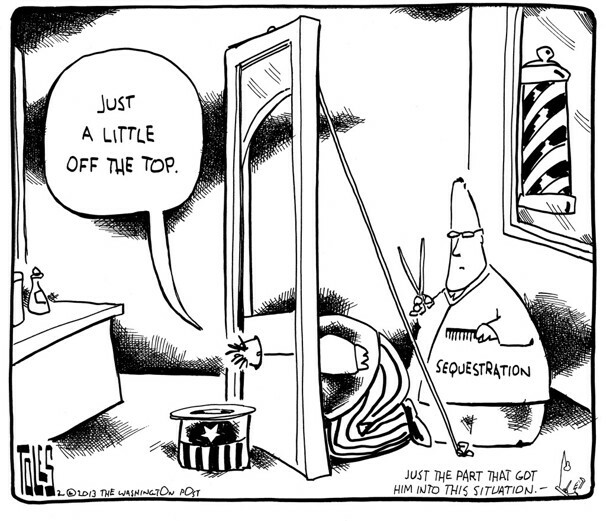 We are again close to a fiscal cut deadline, the by now infamous sequestration. This one of around US$ 85 billions in the first year (around 40 billions or so in defense spending), mostly in discretionary spending (10 billion or so in Medicare), accumulating to a total of US$ 1.2 trillions until 2021, which is obviously not what the doctor recommended. Some have suggested that the size of the initial cut is small, around 0.5% of US GDP, and should have limited impact. Some simple back of the envelope calculations suggest that the effects might be worse than they think. So let's say that the multiplier is between 1 and 1.5, which wouldn't be completely out of line with some measures in the literature. This suggests a fall in output between 85 and 127.5 billions, or between 0.5% and 0.75% of GDP. Assuming an Okun effect of 2, that is that a decrease in output of 2% increases unemployment in 1%, then an increase in the unemployment rate between 0.25% and 0.375% should be expected. Does not seem that large indeed, but that is if you're not looking for a job. But note that this comes on top of an economy that has already a relatively high level of unemployment (even larger than the official numbers), and that it is the first (and the smallest) in a series of cuts that will continue (if the sequestration goes as planned) for 9 years. So it will make a very weak recovery, even weaker. Finally, given that a lot of the cuts will go to discretionary spending, affecting unemployment insurance and education, for example, it will hurt disproportionally the more vulnerable in society. So the point is that it is a big deal, depending on where you stand. Tom Palley's book From Financial Crisis to Stagnation is now available in paperback for only US$18.47. So don't wait, go get a copy now! Martin Wolf had a few graphs in one of his recent columns that are worth reproducing. The first below shows the growth collapse. 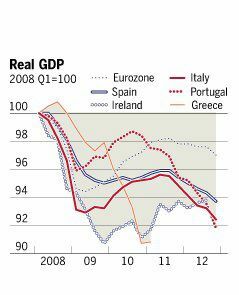 Note that the recovery was very short lived and all rapidly fell into a double-dip recession. And as per Okun's Law, if output falls you should expect unemployment to go up. And indeed up it went. 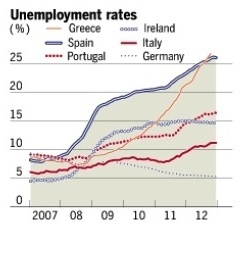 Greece and Spain breaking the Great Depression like barrier of 25% of the labor force. So that's what austerity does. Back in the 1930s a similar situation is what made anyone that was reasonable Keynesian. Frankly, it's a bit boring. 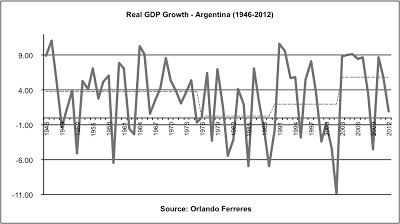 But every time you show the actual data on Argentina's growth someone says it's just good luck. 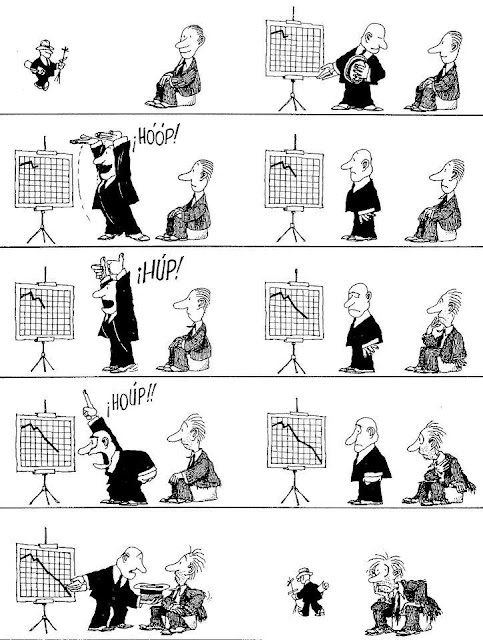 The terms of trade boom. 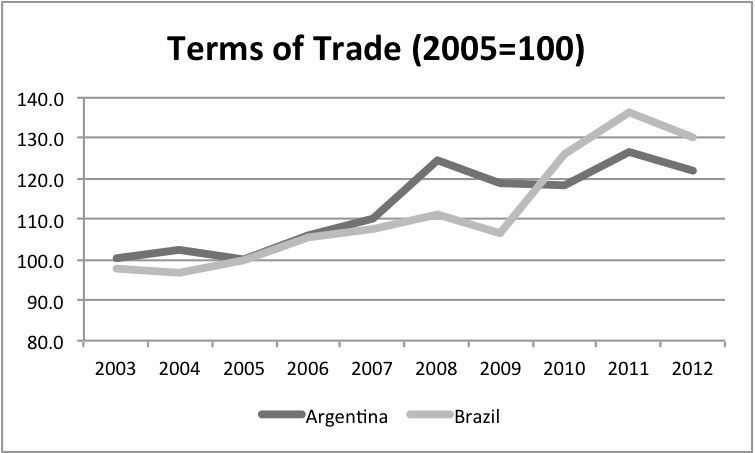 Data below compares terms of trade in Argentina and Brazil in the same period, 2003-12 (Kirchner-Kirchner and Lula-Dilma). Not very different, and if something terms of trade improved a little bit more in Brazil (33% against 22% approximately, for the whole period). Note that metallic commodities (Brazil is a big exporter of iron ore) increased more than agricultural goods (both Brazil and Argentina are big exporters of soybean and derived products, for example). So did Brazil grew more than Argentina, which is what you would expect if external conditions determined growth? See graph below. As it turns out Argentina grew 5.8% against 3.6% in Brazil. Further Brazil has a larger current account deficit. 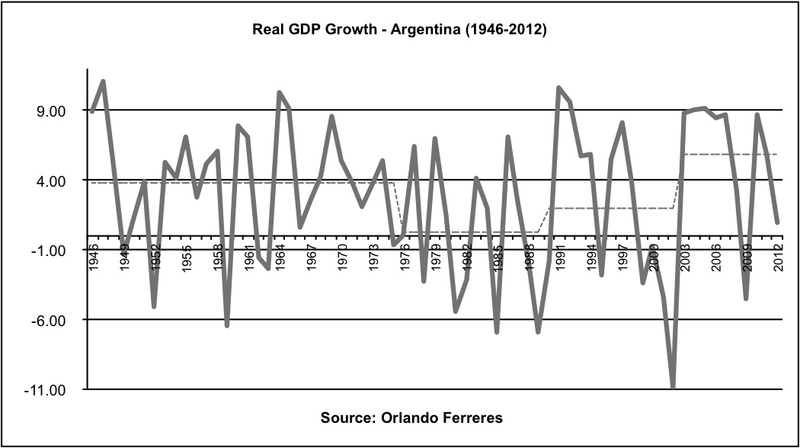 Fiscal and monetary policy were more expansionary in Argentina, and the nominal and real exchange rates more devalued. Let alone that the average real wage grew more in Argentina. So no it was NOT all external conditions. Can we please, pretty please, with sugar on top, stop just venting prejudices and get the data before we talk. You are entitled to be against the policies of the government, you might even be for the policies of the Washington Consensus (people have defended crazier ideas). But, as Daniel Patrick Moynihan used to say, you are not entitled to your own facts. So again, because some didn't get the memo. 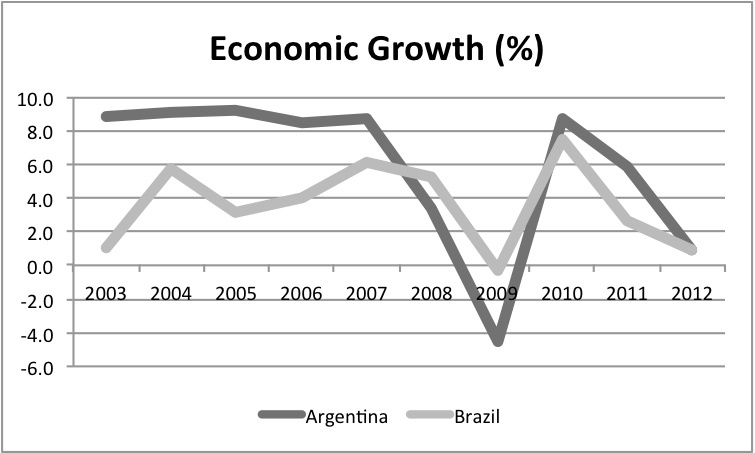 How 'bad' has been Argentina's performance since the crisis in 2002? Well if you use the numbers put out by Orlando Ferreres, not the government official data, with inflation at around 25% or so, what you get is the graph below. Note that the average rate of growth in 2003-2012 is about 5.8% better than at any time in the post-war period (in fact, in recorded history). In the neoliberal era the rate of growth was 0.2% between 1976 and 1989, and 1.9 between 1990 and 2002, while in the State-led growth period it was a healthy 3.8%. 'Nough said. These are not opinions. Simply the facts. And no there is NO problem with these measures. These are the data use by the critics of the government. This is not say that everything is fine in Argentina. But certainly the country does not need a return to the failed policies of the Washington Consensus. "The history of the professions is an essential part of the story of 'intangible' values. Scholarly prestige, restrictive practices through the enforcement of licensing, relatively high personal income—all these factors individually reinforced each other and in combination made possible the social ascent of the professionals." He suggests that the financial independence of certain professional categories in Europe (lawyers and doctors, for example), when compared with Asia, might explain some of the divergnet paths between the regions. Before, we go down the road of eurocentrism, I want to note the following table from the book. Cipolla notes that prostitution went hand in hand with the process of economic development. According to him: "in the sixteenth and seventeenth centuries, the two major centers of prostitution in Europe were Venice and Rome, a primacy which, with the Industrial Revolution, was to be taken over by London and Paris." The decline in the number of prostitutes per 1,000 inhabitants in Rome by the late 17th century is part of that decadence. I would like to see some revisionist research on the proeminence of prostitution in China. Or maybe the West was 'ahead' in this category at least. And yes Vegas is a sign of development! Acemoglu and others have discussed the concept of reversal of fortune, the idea that the areas with high income per capita around the 1500s (basically the areas colonized by Europeans in the Americas and Asia) became relatively poor, and vice versa. The idea is that there is a negative relationship between economic prosperity in 1500 and income per capita today. They suggest that the type of settlement and the institutions built by colonizers explain the apparent paradox. The idea is that in settlement colonies, were more equalitarian societies were built, institutions protected property rights and led to higher investment and growth (à la North). They use the mortality rates associated to a particular region as an instrument for the type of settlement and institutions built by European colonizers. High mortality rates imply low European population density, more indigenous or African slaves, and more unequal institutions, with less protection of property rights. It is a clever argument, no doubt (put forward by Engerman and Sokoloff, in fact), and more importantly a creative use of the notion of settlement colonies. * I have several problems with it, nonetheless. It is far from clear that equality is really connected to growth, and that causality runs from Western type property rights to growth, rather than vice-versa. I tend to spend quite a bit of time on this in my Latin American History classes. There are also significant problems with Engerman and Sokoloff's notion that institutions responded to factor endowments [fundamentally the idea that in capital-abundant/labor-scarce societies, wages were high leading to technological development; yes the capital debates again, but I'll leave this for another time]. Recently I found the graph below in Angus Maddison's Contours of the World Economy 1-2030 AD: Essays in Macro-Economic History. The graph shows that Southern Europe, North Africa, and the Eastern Mediterranean were the high income regions, while Northern Europe was relatively poor. In this case, in fact, disease is not a good guide for the type of institutions built in the different regions. Other than the Italian Peninsula, it is the Nile Valley, i.e. Egypt, that had the highest income per capita during the Roman Empire. The Reversal of Fortune is also evident in this case, with France having a significantly higher income per capita than Egypt, for example. It is hard, however, to think that mortality rates associated to tropical diseases (with Southern Europe and North Africa closer to the Tropics) would have something to do with this particular reversal of fortune. It was the region of older agricultural settlement, more urbanized, more directly connected with Eastern trade, the Eastern Mediterranean part of the of the Empire that was more developed, and that survived for a longer period (until the Turkish conquest of Constantinople in 1453). The reasons for the reversal of fortune in this case, are connected to the rise of the Atlantic economy, related to the Great Discoveries, and the expansion of the African route to Asia. If you ask me, more relevant than the incentives provided by property rights in explaining the Portuguese (and then Dutch and British) search for the alternative routes to Asia, is the rising and changing patterns of demand in Western Europe (and success is based on the naval-military advantage, Guns and Sails, Cipolla would say). But for our purposes here it is only relevant to note that mortality rates no longer seem a relevant instrument for the types of institutions. * Moses Finley suggests that the idea of settlement versus exploitation colonies (note that Acemoglu et al., avoid the use of the term colonies of exploitation referring only to the settlement ones) was originally developed by Wilhelm Roscher of the German Historical School and later by Paul Leroy-Beaulieu, a liberal (in the European sense of the word) French economist. A New Blog (in Spanish) Crisol Econométrico (something like A Melting Pot of Econometrics; traduttore, traditore!) for those interested in quantitative and heterodox analyses of economic policy in Latin America. Last entry on hysterisis, which we dealt also here, and unit roots. The Heterodox Economics Student Association (HESA) will be hosting three events. If you are in Salt Lake don't miss them. From Hegel’s Idea of Alienation to Karl Marx's "Humanitäre Praxis"
A while back I wrote about bitcoins, the decentralized digital currency, that has a rule based supply creation process, supposedly to avoid inflation. As I noted, in Bitcoinland, a fictional country that uses bitcoins, everything is imported, and, as a result, prices of goods and services in bitcoins are heavily dependent, if you live in the US, on the exchange rate between bitcoins and dollars. The graph below shows the evolution of the BTC/US$ US$/BTC exchange rate. As you can see, beyond the hike in the exchange rate back in mid-2011, now again there is a significant depreciation approciation of the value of bitcoins. Since the beginning of the year the BTC/US$ exchange rate has gone from around 13 dollars per bitcoins to slightly more than 26. That is, prices in bitcoins have increased decerased by a hundred percent in less than two months, without a significant change in the supply of bitcoins. Meanwhile, in spite of all the increase in money supply (dollars that is), prices have been stable (no change) in the last two months of 2012 (last data available here). There is more to deflation or inflation than controlling money supply. PS: Oops. Yes, as it can be seen in my previous post, I have the exchange rate upside down. Blame it on my Latin American roots, since we quote domestic price of foreign currency. The point remains that there is no significant connection between the supply of currency and the price level. Thanks to f for noticing. Over the past three decades Latin America and the Caribbean have experienced lower long-run growth in relation to other regions. The available evidence indicates that Latin America and the Caribbean had the highest levels of GDP per capita growth in the 1970’s decade in relation to other regions, with the exception of East Asia and the Pacific. Thereafter, the region has registered one of the lowest rates of growth of GDP per capita in relation to other developing regions for most of the periods under consideration (1981-1990; 1991-2000; 2001-2009, 2001-2011). Moreover the growth differential between Latin America and the Caribbean and other regions such as the case of East Asia and the Pacific has widened over time. The most recent period of expansion (2003-2007) does not constitute an exception to this observed trend. During this time Latin America and the Caribbean experienced the highest average rate of growth in over three decades. The regional average per capita growth rate reached 3.7% surpassing not only that of the 1980’s lost decade and that registered during the free market structural reform era (1991-2000) (1.4%) but also that of the 1970’s (3.2%). However, on a comparative basis, Latin America and the Caribbean’s performance was by no means an exceptional one. In fact the regional rate of growth remained significantly below those of East Asia and Pacific (9.3%), Europe and Central Asia (7.4%) and South Asia (6.6%). In a recent paper (Weak expansions: A distinctive feature of the business cycle in Latin American and the Caribbean) we (Esteban Pérez Caldentey, Daniel Titelman and Pablo Carvallo) argue that part of the explanation lies in the specific features of the Latin American and Caribbean cycle. In spite of the fact that cycle fluctuations are traditionally associated with a short-period context, these can also impinge on long-run growth by their effects on investment and productivity, among other variables. According to our analysis which uses two standard cycle methodologies (Classical and Deviation Cycle) and a comprehensive sample of 83 countries worldwide including all developing regions, we show that the Latin American and Caribbean (LAC) cycle exhibits two distinctive features. The first and most important one, is that Latin America and the Caribbean register weaker expansions, both in terms of duration and intensity, than those of other regions and in particular than those of the East Asian and Pacific region. A second distinctive feature is that Latin America and the Caribbean’s contractions conform in terms of duration and amplitude to those of the rest of the world. Weaker expansions and convergent contractions imply, as a result, that the complete cycle of expansions and contractions tends to be shorter and with a smaller amplitude, for Latin America and the Caribbean relative to other regions of the world. The findings presented in this paper open important avenues to further explore and analyze the short and long-term performance of Latin America and Caribbean economies. First cycle analysis should increase its focus on the nature and behavior of expansions. Sustaining evidence is provided by the fact that contractions tend to be somewhat homogeneous across regions in terms of duration and amplitude. However, this is not the case of expansions. Expansions are heterogeneous in terms of duration and amplitude. Improving our understanding of the differences in the expansionary dynamics of countries and regions, can further our understanding of the differences in their rates of growth and levels of development, including those of Latin America and the Caribbean. Second, as it is well established, the management of the cycle affects the short-run fluctuations of economic activity and hence volatility. But in addition, it is not trend neutral. Hence, the effects of aggregate demand management policies may be more persistent over time and less transitory than currently thought. This provides a justification to reconsider the usefulness of stabilization policies and their effects, from a short and long run view, including their potential trade-offs, and to re-think how to articulate and coordinate what are currently called demand side with supply side policies. * Economic Affairs Officer at the Economic Commission for Latin America and the Caribbean (ECLAC), Santiago, Chile. The opinions here expressed are the author's own and not necessarily those of the institution with which he is affiliated. The State of the Union address last week raised the possibility of increasing the minimum wage, and a debate on the effects of this ensued. Krugman, among others, has quite correctly pointed out that there is no evidence for positive effects of a higher minimum wage on the rate of unemployment. In other words, a higher minimum wage should not lead to a higher level of unemployment. The classic paper on the subject was written long ago by Card and Krueger. Below I show the recent evidence (2003-2012) on the relation between minimum wage and unemployment rate in Brazil. As it can be seen, minimum wages almost doubled in real terms (left axis; black line), while unemployment (right axis; grey line), in this case for the Metropolitan area of São Paulo, dropped dramatically (source IPEA Data). In the Brazilian case, in which median income has not grown too much, the increase in the minimum wage, together with the expansion of the Bolsa Familia, has been one of the reasons behind the improvement in income distribution during the Workers' Party administrations. This suggests that a higher minimum wage is also an instrument for better income distribution. So it seems that the evidence for an expansion of the minimum wage is quite strong, not just in the US. PS: Note that this does not mean that a higher minimum wage solves all the problems, or that in the case of Brazil the doubling of its value has led to a marked improvement in income distribution. At this point, as shown below, the real minimum wage is at the same real level that it was during the late 1960s to early 1980s period. Historically, the highest levels of the real minimum wage in Brazil were in the second Vargas and the Juscelino Kubitschek administrations, even though higher inflation implied that the real value was more volatile (also, growth was back then more or less double the average rate of growth of the last decade). How unwieldy is your bureaucracy? The economic reporting on the New York Times is not always very sharp, to say the least. If you read Dean Baker's Beat the Press you should know. Their reporting on Latin America is not much better, I should add. So it's no surprise that their reporting on the economies of the region is weak and a bit biased. Simon Romero tells us recently that in Brazil's "once-booming economy stalls, ... [and] 'super salaries, as they have become known here, are feeding newfound resentment over inequality in the nation’s unwieldy bureaucracies." The piece is on the high wages of some public sector workers in Brazil. Note that Brazil's economy has not boomed since the early 1980s. Yes it grew fast right after the 2009 recession (7.5% in 2010) because of expansionary fiscal policy, but the reversal of the fiscal stimulus has led to less than 1% growth last year. Between 2003 and 2011 average growth rate was 3.9% (3.6% between 2003 and 2012), good but not a booming economy by any means. But that's fine, the confusion about Brazil's performance is quite common, in fact. So how large is the public sector bureaucracy in Brazil? According to ILO's LABORSTA total government employment in 2009 was around 10.2 million workers, for a population of slightly less than 200 million. So close to 5.1% of the population. In the US, according to the same source, approximately 22.5 million workers out of a population of close to 310 millions in 2010 were in the public sector. In other words, around 7.2% of the population are public sector employees. And remember that in the US that would be only the civilian public sector employees. If you add the military, which is much larger in the US than in Brazil, then the Brazilian bureaucracy is not that unwieldy. Not particularly large or complex. But yes the article shows that some workers make huge amounts of money. But is that the norm? Using again the same data source, for the year 2002 (the last one in the series) the ratio of public administration to financial sector wages in Brazil was 0.5, while the comparable number for high income countries would be closer to 0.8 (see this IMF paper for more comparisons). In other words, public sector workers in Brazil on average make less than comparable workers in developed countries. Put clearly, the public sector is not large and its workers are not overpaid. Don't get me wrong inequality is a problem in Brazil, and corruption, if there is any (which is what the piece suggests), and lack of transparency should also be combatted. But the idea that inequality in Brazil is caused by the high wages of a few public employees, or that this is what is behind the poor economic performance in Brazil is a joke. The roots of inequality in Brazil run deep (even though inequality fell in the last few years), and if anything is associated with real wages that are too low, public and private sector alike. Median wages have increased only slowly, while minimum wages have grown at a more healthy speed during the Workers' Party administrations. Growth has stalled because fiscal and monetary policy have been tight, even if the latter has loosened a bit in the last year and half. It is time for the reporters at the 'Grey Lady' to stop demonizing the public sector as the cause of all problems. Reagan was wrong, government sometimes is the solution not the problem. 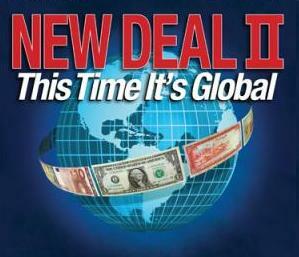 As noted by Richard Kozul-Wright and Jayati Ghosh finance-led globalization has failed. In Argentina we discovered that early on, having applied all the reforms of the Washington Consensus by the early 1990s, only to fail spectacularly in 2001-2. Our crisis was worse than the one during the Great Depression, and preceded the Great Recession by 6 years, which put us on the path of reforming the reforms relatively early. In fact, I suggest that certain lessons from the recent Argentine experience would be valuable for the construction of "a global new deal allowing different economic strategies providing benefits for all." The first fundamental lesson from the Argentine experience is that foreign debt should be maintained to a minimum, and that negotiations with creditors have to be on the basis of ability to pay, putting the well being of the population ahead of interest payments. It is important to note that the default and restructuring of debt obligations is a normal procedure in capitalist economies. Argentina took advantage of the inevitable situation to promote a significant reduction of foreign obligations. Austerity measures at home could be reversed, as a result, and conditional transfers allowed for a rapid reduction of extreme poverty. Note that even after successful renegotiation and resumption of payments, Argentina has not been free from harassment. Vulture Funds have been able to, at least temporarily, seize Argentine property, the International Monetary Fund (IMF) has recently menaced with the possibility of expulsion, and Credit rating Agencies still have the power to treat Argentina debt as junk. For that reason a New Deal must strengthen the position of debtor countries, reduce the power of Vulture Funds and other bad citizens of the international financial community, increase the voice of developing and debtor countries within the IMF, and create an international rating agency that is not captured by financial interests of creditors. A second fundamental lesson from Argentina is that ... Read the rest here. Last Monday, Federal Reserve Vice-Chair Janet Yellen gave the keynote speech at an AFL-CIO economic policy conference on restoring shared prosperity. You can get the papers here. There is a critical review of Michael Cohen's book on the Argentine economy after the default that I wrote, also available here. Fiscal expansion, what fiscal expansion? The data on Federal spending since 2000 can be a little surprising. 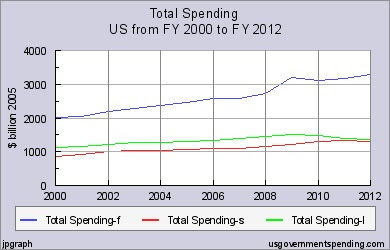 The graph below shows real federal government spending since 2000 (blue line). Note that the expansion from 2000 to 2008, from the last year of Clinton to the last of Bush, was of around 35%. The increase from the last year in the Bush administration up to last year, the last in Obama's first mandate, of slightly less than 20%, most of it in 2009. The problem is that State and Local spending has decreased (red and green), so overall the increase since the recession (2007-8) has not been particularly large. The type of spending is also relevant to understand the effects on the economy as a whole. In the Bush years the biggest expansion was on defense, while in the Obama administration welfare spending has increased the most as a result of the crisis. Mind you, spending on welfare has decreased since the beginning of the recovery, while military spending slowed down, but has still continued to increase. "It is terrific to contemplate the abysmal gulf of incomprehension that has opened itself between us and the classical economists. Only one century separates us from them: [then the following sentence, here reproduced in italics, is added as a footnote] I say a century; but even ½ a century after, in 1870, they did not understand it. And during the preceding century an obscure process of ‘disunderstanding’ had been going on. How can we imagine to understand the Greeks and the Romans? [then the following sentence, again here reproduced in italics, is added as a footnote] Or rather, the extraordinary thing is that we do understand, since we find them perfect, Roman law and Greek philosophy. The classical economists said things which were perfectly true, even according to our standards of truth: they expressed them very clearly, in terse and unambiguous language, as is proved by the fact that they perfectly understood each other. We don’t understand a word of what they said: has their language been lost? Obviously not, as the English of Adam Smith is what people talk today in this country. What has happened then?" This is exactly why HESA students in Utah have a T-shirt that says: "I've read Adam Smith, and understood it." * Pasinetti, L. (2001), "Continuity and Change in Sraffa’s Thought: an Archival Excursus," in T. Cozzi and R. Marchionatti (eds. ), Piero Sraffa’s Political Economy: a Centenary Estimate, London: Routledge. "A good deal of Theology, Philosophy, History, Political Science, Sociology, Anthropology, and of course Economics is devoted to answering ... three questions. 1. Who Gets the Surplus? 3. What do the Surplus Getters do With the Surplus After They Get It?" This suggests that the surplus approach is actually the unifying theme of social sciences. Seems about right. PS: Of course modern mainstream economics has abandoned the notion of the surplus, and has tried (still is trying with some degree of success, I might add) to colonize other social sciences. An e-discussion group on development strategies after the Millennium Development Goals (MDGs) co-organized by Richard Kozul-Wright and Jayati Ghosh is available here. They also published a manifesto for a New Deal for Global Development here. There lots of discussions and blog posts (e.g. Butch Montes, Dani Rodrik, and yours truly). Check it out. This paper excavates the set of ideas known as modern monetary theory (MMT). The principal conclusion is that the macroeconomics of MMT is a restatement of elementary well-understood Keynesian macroeconomics. There is nothing new in MMT’s construction of monetary macroeconomics that warrants the distinct nomenclature of MMT. Moreover, MMT over-simplifies the challenges of attaining non-inflationary full employment by ignoring the dilemmas posed by Phillips curve analysis; the dilemmas associated with maintaining real and financial sector stability; and the dilemmas confronting open economies. Its policy recommendations also rest on over-simplistic analysis that takes little account of political economy difficulties, and its interest rate policy recommendation would likely generate instability. At this time of high unemployment, when too many policymakers are being drawn toward mistaken fiscal austerity, MMT’s polemic on behalf of expansionary fiscal policy is useful. However, that does not justify turning a blind eye to MMT’s oversimplifications of macroeconomic theory and policy. While agreeing on many theoretical principles the paper suggests that oversimplification limits the understanding of the complexities of policy making. "Virtually every monetary economist believes that the CB [Central Bank] can control the monetary base and…the broader monetary aggregates as well. Almost all of those who have worked in a CB believe that this view is totally mistaken…"
Goodhart, C. A. E. (1994) "What should central banks do? What should be their macroeconomic objectives and operations," Economic Journal, 104, November, pp. 1424-36. Argentina has announced that informal price controls will be in place for the next few months. A good thing if you ask me. Yet, you can expect a barrage of criticism about the inefficiency of price controls in the media, and by 'expert' economists to follow. Note, however, that from 1941 to 1946, during World War II, the United States applied a very successful program of price controls. A good description can be found in John Kenneth Galbraith's A Theory of Price Control, in which he describes his experience as Commissioner of Prices. An interesting story Galbraith used to tell (see here) is that they would have a sign to tell when some industrialist that wanted to hike prices tried to suggest that he would go broke if that didn't happen. They would move their index and middle fingers like the antennas of ants. The story went that this little ant rolled a dung of horseshit up a mound, and when it lost control of it, and the dung rolled down in the direction of the anthill, all the ants nervously signaled each other (moving their antennas) to "stop that horseshit." Prices increased on average 5.8% annually between 1941 and 1946 (they accelerated a bit in 1947, after price controls were lifted, but didn't get out of control). 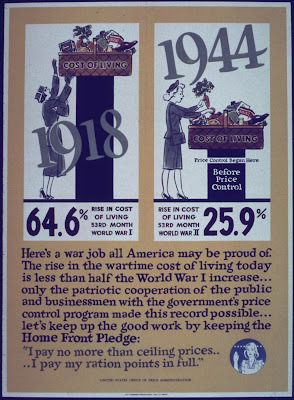 Note that the rate of unemployment was at very low levels reaching 1.2% in 1944. This is not to say that all price control systems work perfectly, but that under certain circumstances they might be a useful way of controlling inflation. PS: By the way, the US had an extensive bureaucratic machine to enforce the application of price controls. Also, certain shortages were considered acceptable during a war period. But note that similarly certain shortages should be normal in a developing country with a balance of payments constraint. In his second inaugural President Obama referred to iconic events in the history of gender, race and gay rights, putting the idea of equality at the center of his agenda. While several pundits were surprised or offended, depending on their political leanings, with the liberalism of Obama’s discourse, and a few noted the momentous effect of pairing gay rights with gender and race, nobody (at least to my knowledge) complained about the conspicuous absence of workers’ rights. Okay so maybe citing the notorious Haymarket riot and the martyrs of the Knights of Labor was too much to expect from an American president. In fact, Samuel Gompers and the American Federation of Labor (AFL), as it is well known, never had a positive view of the anarchists associated to more combative labor tactics. In part, that’s why while the whole world, knowingly or not, commemorates the Haymarket affair every May Day, Labor Day in the US is relegated to the first Monday of September. But still a nod to labor would have been essential to really claim that this is a president moving in a liberal direction. Don’t get me wrong, I think the speech was great, and understand the difficulties of pushing a progressive agenda against a Republican party that refuses to engage in rational politics. But I’m still surprised of how low the idea of labor rights has sunk, that nobody even notices that they are not mentioned at all, this in a week in which we are told that the union membership rate was 11.3 percent, the lowest in almost a century. Obama did talk about jobs, and the difficulties ahead, it’s true. And we should count our blessings, since things could have been much worse (not really a good campaign slogan though). The graph below shows the recovery in employment now compared with the Great Depression, and although slow, it’s clear that active fiscal and monetary policies stemmed a comparable fall in employment. But that should not lead us to believe that thinks are all picture-perfect. Not only employment will take a long while to return to the pre-crisis level, but also the rate of unemployment (at 7.8 percent or so) is considerably higher than it is often understood. Since the late 1990s the participation rate, the number of workers in the labor force, has decreased from around 67 percent of population to less than 64 percent. In other words, discouraged workers that cannot find jobs, simply leave the labor market. If one were to recalculate the unemployment rate, but assume that those discouraged workers were still in the labor force (that is, using a participation rate similar to the late 1990s) then the level of unemployment would look like in the figure below. The adjusted unemployment rate would be close to 12.5 percent. More importantly, it is clear that the labor market has been in bad shape throughout the whole 2000s. And, if anything things are getting worse for workers. The so-called “right-to-work” (RTW) laws, which are laws that prohibit unions from requiring a worker to pay dues even when the worker benefits from a union negotiated collective bargaining agreement, continue to expand, and with Michigan’s recent addition, now almost half States passed this union busting legislation. Also, restrictions on the ability of public employees to bargain collectively have been on the rise, as was prominently displayed in Wisconsin. Note that RTW legislation seems to have a clear negative effect on real wages. If nothing else because union workers make more than non-union workers (the wage premium for union workers is 13.6 percent; see Table 4.33 in EPI’s State of Working America), and discouraging union membership then should have a negative impact on the wage mass. Note also that unionization does NOT really have a negative effect on employment (if this were true Swedes would all be unemployed), as noted by Jared Bernstein. By the way, this suggests that the evidence is that right-to-work legislation is to work creation as right to bear arms is to security of children in school. But we do live in a Doublespeak world in which job creators do not create jobs after all. To stop this unrelenting campaign by corporations, that use State level legislation to undermine workers’ rights we need a national party willing to stand for those rights. So if not Haymarket, at least a reference to the National Labor Relations Act of 1935, the so-called Wagner Act, which protected the rights of unions, and spearheaded the prosperity of the so-called Golden Age. It’s great to expand the liberties of minorities, but it is also important not to forget that workers’ rights have been undermined by the rise of corporate power, and that work, as much as gender, race, ethnicity and sexuality, define who we are. How is that confidence thing working for you? One comic strip is worth a thousand words. Nough said!